The Obama administration has agreed to provide disability benefits totaling more than $2 billion to veterans who had been exposed to contaminated drinking water while assigned to Camp Lejeune in North Carolina. The decision was quietly made public Thursday with a notice in the Federal Register, the government's official journal. Beginning in March, the cash payouts from the Department of Veterans Affairs may supplement VA health care already being provided to eligible veterans stationed at the Marine base for at least 30 days cumulative between Aug. 1, 1953, and Dec. 31, 1987. Veterans will have to submit evidence of their diagnosis and service information. Outgoing VA Secretary Bob McDonald determined that there was "sufficient scientific and medical evidence" to establish a connection between exposure to the contaminated water and eight medical conditions for purposes of awarding disability compensation. The estimated taxpayer cost is $2.2 billion over a five-year period. The VA estimates that as many as 900,000 service members were potentially exposed to the tainted water. "This is good news," said retired Marine Master Sgt. Jerry Ensminger, whose daughter Janey was born in 1976 while he was stationed at Lejeune. Janey died from leukemia at age 9. Ensminger now heads a veterans group, The Few, The Proud, The Forgotten, which advocates for those seeking disability compensation. "This has been a hard, long slog," said Ensminger, who says the government must go further in covering additional diseases. "This is not the end of the issue." The new rule covers active duty, Reserve and National Guard members who developed one of eight diseases: adult leukemia, aplastic anemia, bladder cancer, kidney cancer, liver cancer, multiple myeloma, non-Hodgkin's lymphoma and Parkinson's disease. Documents uncovered by veterans groups over the years suggest Marine leaders were slow to respond when tests first found evidence of contaminated ground water at Camp Lejeune in the early 1980s. Some drinking water wells were closed in 1984 and 1985, after further testing confirmed contamination from leaking fuel tanks and an off-base dry cleaner. The Marine Corps has said the contamination was unintentional, occurring when federal law didn't limit toxins in drinking water. Spurred by Ensminger's case, Congress in 2012 passed a bill signed into law by President Barack Obama extending free VA medical care to affected veterans and their families. But veterans were not automatically provided disability aid or survivor benefits. The issue has prompted lawsuits by veterans organizations, which note that military personnel in Camp Lejeune housing "drank, cooked and bathed" in contaminated water for years. "Expanded coverage is making progress, but we also need to know whether the government may be purposefully leaving people out," said Rick Weidman, executive director of Vietnam Veterans of America. Veterans, former reservists and former National Guard members who served for at least 30 days at the U.S. Marine Corps Base from 1953 to 1987 and have been diagnosed with one of eight diseases are eligible, according to the document published in the Federal Register, the government’s official journal. The Associated Press, which first reported the story, said the estimated cost to taxpayers of the added benefits would total $2.2 billion over five years. The additional payments from the Department of Veterans Affairs would start in March and go to veterans who developed adult leukemia, aplastic anemia, bladder cancer, kidney cancer, liver cancer, multiple myeloma, non-Hodgkin’s lymphoma and Parkinson’s disease, the notice said. After years of waiting, veterans who were exposed to contaminated drinking water while assigned to Camp Lejeune in North Carolina may now be able to receive a portion of government disability benefits totaling more than $2 billion. The Department of Veterans Affairs described the new benefit Friday as “historic.” It is one of few instances in which former military personnel who weren’t deployed for war could become eligible for cash payouts. Outgoing VA Secretary Bob McDonald determined there is sufficient scientific and medical evidence to establish a “strong association” between exposure to the contaminated water at Camp Lejeune and eight medical conditions. Beginning in March, the disability benefits may supplement VA health care already being provided to eligible veterans who were stationed at the Marine base for at least 30 cumulative days between Aug. 1, 1953, and Dec. 31, 1987. Veterans will have to submit evidence of their diagnoses and service information. The estimated taxpayer cost is $2.2 billion over a five-year period. As many as 900,000 service members were potentially exposed to the tainted water, although the VA estimates that roughly 23,000 veterans will apply and qualify for the benefit. “There’s no doubt that the people of Camp LeJeune were poisoned,” said retired Marine Master Sgt. Jerry Ensminger, who was stationed at Camp Lejeune when his daughter, Janey, was conceived in 1975. Janey died of leukemia when she was nine, CBS News’ Mark Strassmann reported. It allows veterans to qualify for government disability aid based on toxic harm sustained while at a garrison, as opposed to a battlefield. In 2015, McDonald also agreed to award disability benefits for another category of veterans who weren’t on the ground, those who had developed medical conditions after exposure to Agent Orange residue on planes used in the Vietnam War. Documents uncovered by veterans groups over the years suggest Marine leaders were slow to respond when tests first found evidence of contaminated groundwater at Camp Lejeune in the early 1980s. Some drinking water wells were closed in 1984 and 1985, after further testing confirmed contamination from leaking fuel tanks and an off-base dry cleaner. The Marine Corps has said the contamination was unintentional, occurring when federal law didn’t limit toxins in drinking water. Ensminger credited North Carolina Republican Sens. Richard Burr and Thom Tillis for their efforts. Burr introduced the 2012 legislation to provide free VA medical care. 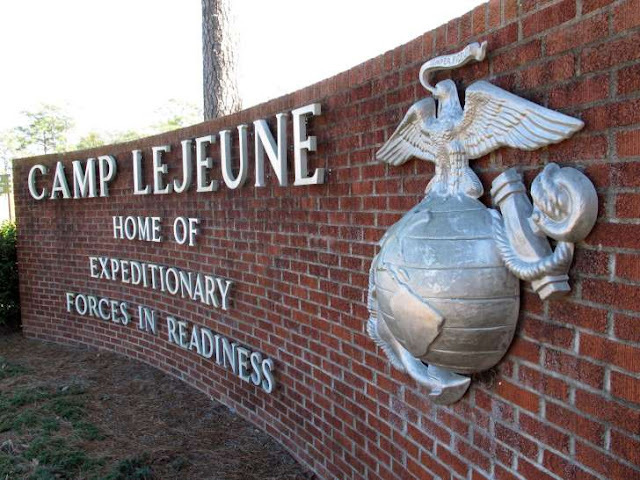 Affected veterans who were stationed at Camp Lejeune may now submit applications for benefits. Roughly 1,400 disability claims related to Lejeune are already pending, and will be reviewed immediately, according to the VA.
0 Response to "US agrees to pay billions to Marines affected by toxic water"